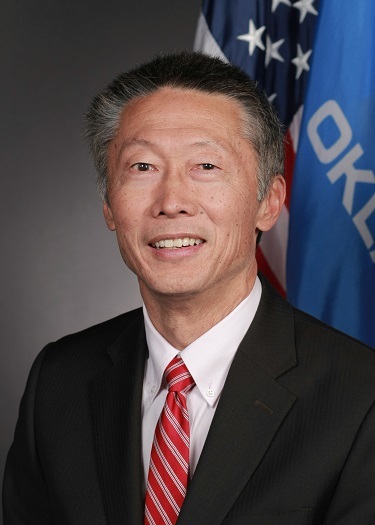 State Sen. Ervin Yen (R-OKC) has filed two measures that would seriously restrict and regulate the practice of midwifery in Oklahoma. SB 714 [info, bill language] would prohibit the professional use of the term "midwife" unless the individual "meets the licensing requirements for a Registered Nurse license issued by the [Oklahoma] Board [of Nursing]", while SB 747 [info, bill language] would prohibit Certified Nurse-Midwives from performing a Vaginal Birth After Cesarean (VBAC) outside of a hospital setting (i.e. homebirth). Yen, a former cardiac anesthesiologist, was first elected to the State Senate in 2014. I contacted Sen. Yen to get his reasoning for the bills. For the other side, I got a response from the Midwives Society of Oklahoma, the Oklahoma Midwives Alliance, and the Oklahoma chapter of the National Association of Certified Professional Midwives. According to statistics from the CDC, Oklahoma has the 6th lowest VBAC rate in the nation. Only a handful of hospitals in Oklahoma even offer or allow VBACs (in large part due to malpractice insurance not allowing them), making it difficult for women to obtain them if they so desire. VBACs are, indeed, difficult to obtain in Oklahoma hospitals, even though the American Congress of Obstetricians and Gynecologists agrees that VBAC is safer than a repeat C-section and recommends that trial of labor be offered to most women (Practice Bulletin #115, "Vaginal Birth after Previous Cesarean Delivery," published in the August 2010 issue of Obstetrics & Gynecology). As required by the Oklahoma Midwives Alliance and the Midwives Society of Oklahoma’s guidelines, all women who attempt out-of-hospital VBAC are given an informed consent document outlining the small but real possibility of a complication that could result in injury or death to both mother and baby. Each client’s history and current pregnancy is evaluated to ensure that certain clinical criteria are met in order for her situation to be deemed appropriate for an out-of-hospital VBAC. Yen's primary issue with both of these bills is focused on regulating and licensing midwives. "When I look [different types of Oklahoma midwives] up, I can't seem to find any data on their training, they're not licensed by any state entity. And so I decided that's not right. If someone's going to call themselves a midwife and help a woman deliver at home, I think they need to have some standard training. Now, I'm not saying that a woman can't deliver at home. Women have been doing that for eons, since the beginning of time, and I think they should still be allowed to do that, and I think that they can utilize anybody that they want to help them ... In Oklahoma, I just think that you should not be able to call yourself a midwife unless you're one of these Certified Nurse Midwives that is licensed by the state of Oklahoma." We believe Sen Yen’s plan to restrict midwifery to only CNMs is not in the public's best interest. The bill erroneously presumes that midwifery and nursing are bound when in fact there are three groups of midwives in the US that hold a national credential: the Certified Professional Midwife (CPM), the Certified Nurse Midwife (CNM) and the Certified Midwife (CM). Only the CNM credential has a nursing prerequisite. This bill would prevent other professional midwives from practicing their trade and serving the families of Oklahoma, and would leave most women who choose out-of-hospital birth without a qualified attendant. 92% of the homebirth midwives in Oklahoma are Certified Professional Midwives (CPMs) and we attend the large majority of out-of-hospital births. Direct entry midwives have been openly attending births in Oklahoma continuously since statehood. We provide comprehensive prenatal care, report our statistics to and file birth certificates with the state, have public health lab accounts so that we can provide needed newborn screening, and work with various other state agencies to insure our clients receive exceptional care in line with the standard of care in Oklahoma. Additionally, this bill would end the livelihoods of many small business owners who have enormous amounts of time and money invested in their careers. Some have been practicing as long as 35 years, and all of them have made serious sacrifices to attain their positions and serve their communities. In my conversation with Senator Yen, he returned numerous times to his belief that midwives should be regulated by the State: "If somebody comes to me and can show me that there are other midwives in the state besides these Certified Nurse-Midwives, that are well-trained and can do a good job, I'd say that's fine, but I think that they should be somehow licensed or supervised or certified by the state." Currently, Oklahoma only recognizes and licenses Certified Nurse-Midwives, but does not ban or restrict other midwives from practicing. In SB 714, Yen's bill language states that "No person shall use the professional designation of "midwife" [...] unless such person meets the licensing requirements for a Registered Nurse license issued by the Board. ", however, according to his numerous statements it seems his intent is that the requirement should be CNM-level (Master's degree) rather than RN-level (Bachelor's degree). Yen: "If my bill were to pass, if you wanted to be called a 'midwife', you would need to be one of these Certified Nurse Midwives." Yen: "In order to call themselves a midwife, they'd need to be a CNM. Anybody else can help a woman deliver, but they just cannot call themselves a midwife. Again, if these other non-Certified-Nurse-Midwives can show me that they have reasonable training, I'll consider adding them, but they're going to have to do that, and I think they need to be somehow licensed by the state." Yen: "In order to call yourself a midwife, you'd need to be a CNM. And again, I am open to including others in there if they're properly trained, and if they're licensed and certified by the State of Oklahoma." I pointed out the discrepancy between his statements of requiring CNM status when the bill language appears to require RN status instead. He said, "Well, that's not the intent. The intent is that you cannot call yourself a midwife unless you are a Certified Nurse Midwife; that's a RN that has had midwifery training. Now if the bill doesn't read that way, I promise you that we will fix it." The Midwives coalition responded to Yen's idea: "Direct-entry midwives of Oklahoma have traditionally done an excellent job of self regulating, all without additional expense to our clients or the state. Many Oklahoma CPMs prefer to remain unregulated at this time, though most would be comfortable working under some kind of state oversight as long as it recognizes the legitimacy of midwives who are aligned with the international standards for midwifery and is managed by a pro-midwifery body. History has shown us that there is a legitimate concern that the state may place unfair and unreasonable restrictions on the practice of midwifery, effectively removing the right of birthing women to choose what kind of care they receive and from whom. If it comes to this, there are many excellent models in the US, as 30 states currently recognize CPMs. It is important to note that not one state has ever repealed their CPM licensing legislation." To his credit, Senator Yen said multiple times that he'd be more than happy to discuss his legislation with the Oklahoma midwives, and could be open to some alterations of the final language. The midwives group said that they are working to set up a meeting with Yen. A Facebook group supporting midwifery in Oklahoma was started in response to Yen filing the bills; over 5,200 people are currently members, and supporters have raised about $4,000 to fund their activities (including potentially hiring a lobbyist to monitor legislation that would affect midwifery). Today, the Daily Oklahoman editorial board came out against SB 747 (the VBAC measure). I oppose both of Yen's bills. We planned to have a midwife-assisted homebirth with our baby girl, but after problems surfaced ended up at the hospital for an emergency c-section. When the need arose for more extreme measures, our midwife (a CPM) didn't hesitate to move things to a hospital (as all responsible midwives are prepared to do). She wasn't going to jeopardize my wife and baby's health just to have a homebirth like we had planned. Midwives exist to care for both the mother and baby, and have a vested interest in their best health and successful delivery, even if they end up not being the one to deliver the baby. Midwifery in Oklahoma isn't broken. Midwives provide vital services to many families across the state, and have since before statehood. In some cases, VBACs in particular, they offer options that are simply not available at most hospitals. While the vast majority of mothers will continue to utilize more common methods, let's continue to allow the freedom for others to seek accessible midwifery if they see fit. The incident, while tragic, is still just one incident. Creating legislation off of it that restricts midwifery in OK is knee-jerk and bogus. Thanks for an excellent article that sadly proves once again Senator Yen is out to control people as a statist. He doesn't believe in liberty and self determination as, "we the people" seem fit. As Roman Senator Ticitus said, "As once we suffered from crime, now we suffer from laws."